Home » Allergies » Cannabinoids: The other vitamin “C”? What is a “non-essential” vitamin? Cannibinoids are chemical compounds which act on cell receptors (CB 1) and (CB 2) within the body. In a normal, healthy state, the human body can produce two chemicals, possibly more, which act on these receptors: anadamide and 2-arachidonylglycerol (2-AG). These are called “endogenous cannabinoids”. Outside of the body, the hemp or marijuana plant are known to produce a number of forms of cannabinoids (phytocannabinoids), such as THC, or CBD, which also act on these receptors. (2) These are called “exogenous cannabinoids”, or phytocannabinoids. Should cannabinoids be considered vitamins? I believe that it’s simply a matter of time before cannabinoids, such as those derived from cannabis and the hemp plant, will be recognized as “n on-essential” vitamins. Taking vitamins shouldn’t be a crime. If you’re interested in helping to end the draconian drug laws related to the prohibition of marijuana, the “National Organization for Marijuana Reform Laws” is a good organization to support. Clearly drugs laws do not prevent drug usage, their availability, or their potency. Many people within law enforcement are now speaking out about this. The current drug laws seem even more absurd when you consider that such laws appear to be creating vitamin deficiencies that may be fueling much of our current chronic disease epidemic. Be sure to check out these short educational videos detailing the benefits of consuming raw cannabis, as a means to supplement cannabinoids. Understanding of cannabinoid (CB) actions has been remarkably advanced during the last decade, due mainly to the identification of the G-protein-coupled cannabinoid receptors, namely, CB1 receptors that are predominantly found in the brain and CB2 receptors that are exclusively found in peripheral tissues. Endogenous ligands for these receptors have also been identified. Research to date suggests that the analgesic effect of cannabinoids and the enhancement of opioid analgesia by cannabinoids are both CB1 receptor-mediated via the activation of opioid receptors. The involvement of the CB1 receptor in mediating reinforcing and physical dependence-producing effects of opioids has also been suggested, with the former being considered the result of interaction with the dopaminergic neurotransmission in the midbrain dopamine system. 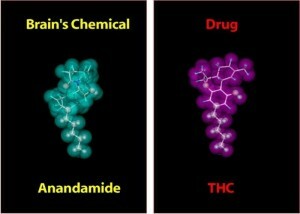 However, the discriminative stimulus effects of cannabinoids have been reported to be highly specific in that the effects were not substituted by other classes of compounds including opioidergic and dopaminergic agents nor were they antagonized by antagonists of various neurotransmission systems, suggesting that the discriminative stimulus effects only involve the cannabinoid system. Thus the cannabinoid actions appear to be classifiable into at least two kinds: 1) those mediated directly through cannabinoid receptors and 2) those mediated indirectly through other systems such as opioidergic systems. Detailed research into these actions may help to elucidate not only the mechanisms of action of exogenous cannabinoids but also the role of endogenous cannabinoids, especially in the brain reward system.